Better later than never. This is the last recipe from the old days (2011). With this recipe, each and every recipe up to batch #50 will be published on my blog. I know there are some tasting notes missing for some of the recipes which I try to add at some point. This recipe was all about the continuous hop addition method used by Dogfish Head Brewery in the US for their IPAs. I started writing this post in July 2012 (yes, I have a lot of unfinished posts in my draft folder) and never had any of Dogfish Head’s min IPAs at this point nor was it easy to get some Simcoe, Amarillo and Columbus hops back then. In fact, my brother and I had to travel to London in Summer of 2011 to get our hands on some of the Dogfish Head beers such as Palo Santo Maron, Indian Brown Ale and Festina Peche. All really enjoyable. We further attended the Great British Beer Festival (GBBF), visited the Meantime Brewery and Fullers and some other non-beer related sight-seeing. I really like London and it is definitely worth a visit. Enough of story telling. The recipe below is a straight forward IPA recipe to put the continuous hop addition method to a test. 04/16/2011: Brew day. This batch was actually brewed by my brother. We originally planned to use Wyeast’s 1187 Ringwood but the starter got contaminated and that’s why we went with a dry yeast instead. All the hops for the boil were blended and every 2 min 1.5 g of the hop blend was added to the kettle. 30 g of Amarillo went into the wort at knock out and the primary fermentation was performed at 20°C (68°F). 04/23/2011: Racked the beer into a secondary fermenter and added the dry hop additions. 05/02/2011: Bottled the beer to a carbonation level of roughly 3 vol of carbon dioxide with some fresh unfermented wort. 06/18/2011: First tasting (beer six weeks in the bottle). Aroma: Lots of mango and slight grass character. 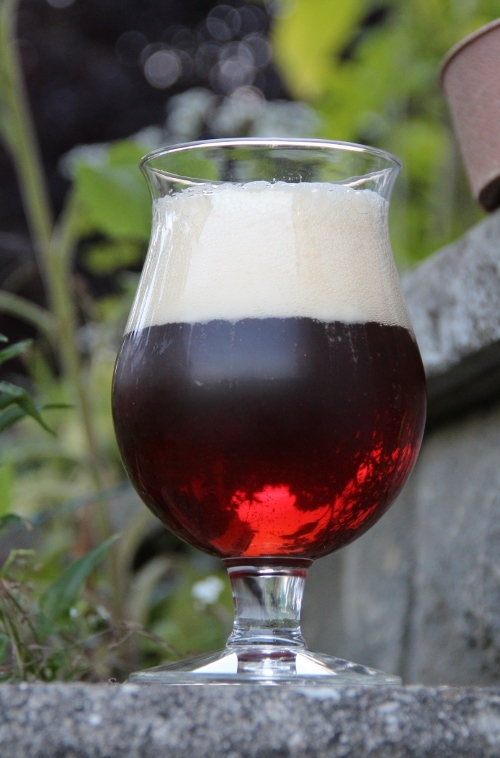 Appearance: Amber, white creamy head with nice bubbles rising to the top. Clear. Flavor: Very grassy, bitter and mango notes. Mouthfeel: Light to medium body, average carbonation level, finishes with a grassy bitterness and a solid malt backbone. Overall Impression: Not bad after all. However, not only is the grassy character really not what we are looking for in an IPA nor having a solid malt structure in the finish. The maltyness in the aftertaste makes this beer rather hard to drink. On the other hand, we did not use the freshest hops since we could not buy Simcoe, Columbus nor Amarillo on a regular basis back then. Once we could get our hands on some of these hops we basically ordered a whole bunch of it and stored them in the freezer. Luckily, this changed and we can now buy Amarillo and Simcoe on a regular basis at our local homebrew stores. Any changes on the recipe? I would go with a normal caramel malt such as Caramunich or Crystal malt instead of the Cara Amber. Second, use fresh hops and maybe increase the dry hop additions. At least double the amount. And reduce the carbonation level to 2 vol. Is it a clone recipe for Dogfish Head’s 60 min IPA? I can’t tell as I had my first 60 min IPA in late September 2013. And the bottle I got was not the freshest example as well. We brewed various IPAs and Pale Ales since and in your opinion there are better and easier ways to get hop aroma and bitterness into a beer rather than using the continuous addition approach. First wort hopping, hop bursting or using Blichmann’s Hop Rocket (TM) incorporates the hop aroma very well in your opinion. That’s it for today. Eureka, it’s time for another recipe. I would like to apologize for the few posts lately. I am currently in the last months of my Master’s degree and try to get as much out of my lab and grid time before sitting down and writing up my thesis (and a publication). I hope to find more time to brew and write afterwards. Back to the recipe, another Berliner Weisse recipe. I did two (more or less traditional) Berliner Weisse before and let the mash turn sour by adding some grains in one case (#44 Berliner Weisse) and one where I used Wyeast’s 3191 Berliner Weisse blend (#61 Berliner Weisse 2) without sour mashing. Comparing the two batches, the one with the sour mash turned out way better than the second one. I even did a dark Berliner in the meantime (using a sourmash) which turned out pretty well. I will therefore never, ever skip the sour mashing step again. And adding Brettanomyces is another must have as well. This recipe is actually more or less the same in terms of grist composition and the process as my very first Berliner Weisse. The only difference here is the dry hopping step with Nelson Sauvin. A dry hopped Berliner Weisse. Lets find out how good hops actually work in sour beers. 06/08/2013: Brew day. Crushed malts, mashed in at 66°C (151°F) and left the mash rest for one hour. Then let the mash cool down to 38°C (100°F) and left it there for 4 days. Then added the Nelson Sauvin hops and heated up to 78°C (172°F), sparged, cooled the wort down to roughly 20°C (68°F) and added an added some WY1056 and left the fermenter untouched for nearly 1 month. 07/07/2013: Racked the beer off the yeast and added the first 75 g of Nelson Sauvin hops. 07/14/2013: Added another 75 g of Nelson Sauvin hops. 07/21/2013: Bottled the beer with a sugar addition to a carbonation level of 2 vol of carbon dioxide and added EBY020 B. jurassienne I or EBY021 B. bruery I to the bottles. I store the bottles at 15°C (59°F) since. 10/27/2013: Beer now 3 months in bottle. Its time for a first official tasting. Aroma: Lots of white grapes and citrus character, some faint funk in the background. Very impressive aroma. Some H2S in the nose (foul eggs) as one swirls the glass. Flavor: White grapes, citrus character, light Pilsner malt character (something between honey, corn and bread), some barnyard funk and light level of sourness in the finish. Very damn tasty! Overall Impression: There are a lot of the typical Berliner Weisse aroma and taste characteristics present in this beer with one exception: the sourness. It is far from what I would expect from a Berliner Weisse. I don’t know if the sourness will increase by further maturating the beer. We will see. Anyway, this is a very neat beer: light, fruity with a hint of sourness. Aroma: Subtle fruit character compared to the EBY021 version. This one is more funky and is driven by leather, horse blanket and a hint of citrus in the back. Some H2S in the nose (foul eggs) and a hint of musty, cellar-funk in there as well. By all means not clean… In one word: funky! Gets more approachable as it warms up. Flavor: White grapes and citrus character. Very dry and not a lot of the backbone shines through. Light level of sourness in the finish however more prominent than in the EBY021 example. Overall Impression: Completely different from the EBY021 version. A very funky example where the hops kind of play in the background. Gets kind of cleaner as it warms up as all the really annoying flavors (H2S, mustiness) kind of disappear. I actually prefer the EBY020 version because it is so refreshing, fruity and light. The EBY021 leads to a rather funky beer which makes it a bit less refreshing in my opinion. It seems to me that the EBY020 Brett strain is not as powerful as EBY021. EBY020 is more on the fruit side where EBY021 really hits you in the face with its funk. Well, EBY021 will get into my next Berliner Weisse again. And the next Weisse will be dry hopped as well. The Nelson Sauvin hops match perfectly with the profile of the Weisse. As both EBY020 and EBY021 are tested in the BBA/EBY Brettanomyces experiment, I am really looking forward how these two strains perform. I haven’t actually brewed my share of the experiment yet as I am way behind my brewing schedule already. However, I will brew the batch for the experiment before the end of the year. Eureka, its time for another recipe publication. Not only am I fascinated about the new arising beer styles in the world but really like to look back as well. One of the rediscovered beer styles is a Polish wheat beer called Grätzer or Grodziskie named after the place where it was originally brewed. This beer style is made with oak smoked wheat malt and with a healthy dose of hops. The result is a clear, smoky and very refreshing beer. Because this beer style heavily depends on the malt and no such malt was easily available up to know, only the ones willing to smoke their own malt had the ingredients to make a real Grätzer. This all changed as soon as the German maltster Weyermann revived the oak smoked wheat malt which is now available again. With this, the most important ingredient for this kind of beer is yet again commercially available. I came across this beer style a while ago and got really excited as I encountered Eichenrauchmalz (= oak smoked wheat malt) at my local homebrew store. I instantly ordered a small quantity of this particular malt to give this beer style a go. And below is my recipe. 06/29/13: Brew day as normal. Mashed in as stated in the recipe, rested at the given temperatures and sparged as usual. I did not add any kind of rice hulls or barley to facilitate the lautering. The lautering went as smooth as ever. I am aware that a lot of people say that it is not possible to sparge a 100% wheat malt mash. Well, I kind of experienced different things in the past and don’t care about any other experiences. I use a perforated metal plate as a filter (see picture below) and this is maybe on of the best investments in my homebrewing career. Since then, the lautering is not a pain any more. However, I encounter difficulties with this plate when I sparge the soured Berliner Weisse mash. Then the mash gets very easily stuck because the entire mash is very mushy. After sparging and collecting the wort in my boiling kettle, I boiled the wort with the additions of the Hallertauer hops, cooled down the wort and pitched a yeast blend of two commercial yeasts (WY1008 German Ale and WY1338 European Ale). Before I cooled down the wort, I filled a 2 L growler with hot, boiled wort for the carbonation step later on. The reason for using two yeast strains is to get the WY1008 out of suspension (low flocculent) with a highly flocculent yeast strain (WY1338 in this example). This is very important because the beer has to be very clear in the end. Primary fermentation at 20°C (68°F). 07/07/13: Racked beer after 8 days to a secondary fermenter. 07/17/13: Bottled beer with addition of wort to a carbonation level of 3.6 vol of carbon dioxide. Added 2 L of unfermented wort to 18 L of green beer. Now the most interesting part, what about the taste? Overall Impression: Very refreshing and surprisingly not too thin for the 2.7 vol alcohol. I am quite intrigued how this batch turned out. Even after three months in the bottles, the beer still has a very prominent smoky, ashy character. This experiment is yet another successful one. Eureka, its time for another recipe. Actually this one is not as straight forward as you might expect from my previous recipes and might be hard to reproduce. The idea for this beer came up during the lautering process of my #67 Koschei Imperial Stout batch. Brewed 51 L (13.5 gal) of Imperial Stout and could not throw away the second runnings which still had a gravity of 12°P (1.048). I therefore used the runnings as a base for this recipe and went from there. This changed in late Spring of 2013. I re-discovered this particular keg in my cellar during an inventory and was quite excited to try a first sip of this beer. The ABV for this one is around 5 %. For a style, it should be something like a dark Berliner Weisse. Since Weisse originates from white in German, it would not much sense to call it a Dark Berliner Weisse. I therefore simply call it a Dark Berliner Sour. Or maybe there is already a suitable beer style for this kind of beer. Let me know if there is a matching beer style for my beer. Aroma: Smells like a cold brewed coffee gone sour with a touch of lemon, dark chocolate and bonfire smoke. Can even detect a hint of gingerbread. Impressive aroma profile and really interesting aroma combination. Flavor: Hint of dark chocolate, very subtle roast character and a nice level of sourness. Even some red grape and wood character like in certain wines. Tobacco is there as well. The sourness and the flavors from the roasted barley really go along really nice. Mouthfeel: Light body, average carbonation level, very dry but not too thin, silky and lightly sour finish. Detectable astringency. Very refreshing. Leaves a smoky impression on the tongue like you get after smoking a cigar. Overall Impression: Quite impressed how this one turned out. Despite the roast character, this beer has a lot of flavors common in red wines. Not only that, it reminds me of Jolly Pumpkin’s Madrugada Obscura. With the exception that this one is not really funky. I am further surprised how the sourness plays with the roasty, astringency characters. The play along really nicely. Eureka, I would like to publish another dark and evil recipe. 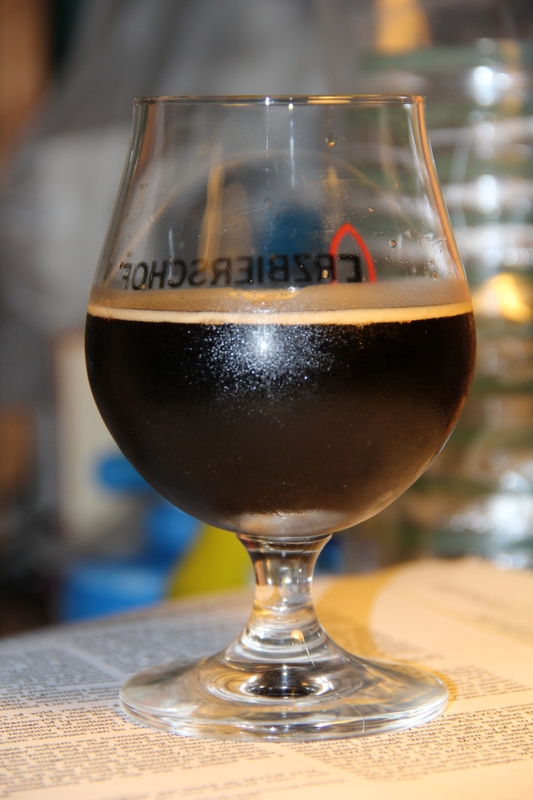 The recipe of today is for a massive Imperial Stout (OG 1.146) and a measured/calculated ABV of 17.6%. 17.6% is my current record in terms of ABV (but it won’t be the record holder for long). Because this beer doesn’t fit the BJCP 13F category for Russian Imperial Stouts, I call it a Universal Stout. The recipe below should get you a wort of roughly 24°P (1.099). Don’t try to get higher original gravities than 1.100 or you might stress the yeasts too much. Let the yeast start the fermentation at lower gravities and increase the gravity step-by-step during the active fermentation by adding further fermentable sugars. Second, use a yeast strain that is able to deal with higher alcohol levels. I chose White Labs WLP099 Super High Gravity yeast strain for this purpose. According to White Labs, this strain should be able to deal with alcohol levels of up to 25% (White Labs WLP099). 03.29.2013: Toasted some oak flakes in my oven at 120°C (248°F) for 20-30 min until the flakes had a brownish color and smelled like popcorn. In then crushed all the malts and mashed everything in at 66°C (151°F). I then left the mash rest for 90 min. Then sparged at 78°C (172°F), collected the wort and added the hops according to the recipe. I further on collected the second runnings for a smaller 12°P (1.048) Stout. I cooled the wort down to 20°C (68°F) and added a massive amount of WY1098 British Ale yeast according to the common pitching rates. The fermentation took off within a couple of hours. 04.02.2013: Four days into the fermentation. Added 200 billion WLP099 yeast cells with a small yeast nutrient addition. Gravity was already down to 8.7°P (1.034). Well done British Ale yeast. 04.06.2013: Added 0.9 kg of homemade candy syrup, 0.5 kg cane sugar, 1 kg of white table sugar, yeast nutrients over the next four days in small, quarter-daily additions. 04.27.2013: Racked beer of the yeast cake into a secondary fermenter. Added 100 g of a 50:50 blend of medium toasted French and US oak chips that have been sitting in some rum for a couple of months. 06.19.2013: Kegged the beer and force carbonated it to a carbonation level of 2 vol of carbon dioxide. And now its time to wait for the first tasting. Concerning the alcohol measurement. I calculated an original gravity of 34°P. One way do evaluate the ABVs is to measure the beer’s terminal gravity with a hydrometer (6.2°P in this case) and measure the Brix using a refractometer (18°Brix in this case). From these two values, one can calculate the actual original gravity. I use “Die Kleine Bieranalyse” for that purpose. In my case, the original gravity was 34.5°P I calculated an ABV of 17.5% from these two values. I am really happy how this batch turned out. Luckily, it was no problem to ferment this beast and the terminal gravity is not too low nor too high. Judging from the first preliminary tasting, the wood character is way better than the beer I matured in an actual Whisky barrel. Will see how this beer develops over the next couple of months. Cheers and stay tuned! Eureka, sharing another recipe with the world. All started with the need to get rid of some ingredients such as leftover hops, malts and yeast. My goal was to brew a hop-forward not too bitter Amber Ale. Something for a general public. On the other hand to use Wyeast’s 3789 Trappist Blend. According to Wyeast, this blend consists of Saccharomyces and some Brettanomyces strain(s). Some say this blend consists of the yeasts used by Abbaye Notre-Dame d’Orval. I chose this blend to be suitable for such a beer because of three reasons. First, serving the fresh beer will not have too much of Brettanomyces character and be more accessible for a general public. Second, the Brettanomyces might help to decreases the body of this rather malty beer and improve the hop aroma. Third, further maturation should give the Bretts enough time to put their fingerprint on the beer aroma/flavor and maybe be more for the Brett lovers. 02/10/2013: Brew day! Nothing special to add here. Basically followed the recipe above. Flavor: Very fruity (tropical fruits) with mango, oranges and some citrus character. Subtle maltyness and very well-balanced (malt and hop). (Tasting July: Fruit character not as prominent anymore. But a bit of Brett twang is definitely there now, balance is now more on the hop/bitter side, malt character vanished). Mouthfeel: Medium body, average carbonation level, no bitter finish. (Tasting July: Rather dry and slightly bitter finish). Overall Impression: This is a very nice brew. It is not overly bitter but has a huge tropical fruit aroma. And I am not the only one that likes this beer. I shared some bottles with friends and they loved it. On feedback I got was like “get this brew on tap”. The character of this beer changed over the last weeks and you definitely get a certain Brett character now. I will further mature the beer and see how much of Brett it will get. 08/11/2012: Brew day number 63. Crushed the grains, mashed in at 64°C and left the mash convert for 90 min. Then sparged and boiled the wort for 90 min with the hop additions mentioned in the protocol above. Then cooled down the wort and pitched fresh Farmhouse Ale yeast and submerged the fermentation vessel in the vat in my shed. 08/23/2012: Racked to secondary fermenter after 12 days of primary fermentation. Gravity down to 2.1°P already. Did the secondary at 20°C (68°F). 09/15/2012: Bottled the raspberry version to a carbon dioxide level of 3 vol and added the Saaz hops to the version without the raspberries. 09/22/2012: Bottled the Saison without the raspberries to a carbon dioxide level of 3 vol. I then left the bottles carbonate for approximately three weeks at ambient temperatures and store the bottles at lower temperatures (not in a refrigerator) since. Aroma: Lots of phenolic and pepper. Smells really nice. Hint of Saazer hops in the nose as well. Flavor: Phenolic and spicy driven beer with some lavender and ginger. Really nice! Overall Impression: Really refreshing with its ABV of 4.5%. Nice phenolic, spicy character. 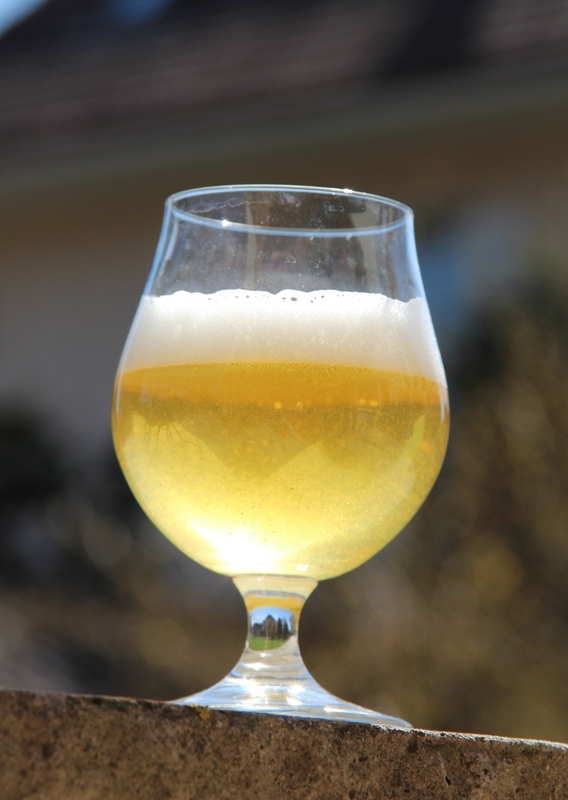 Appearance: Yellow, frothy white, long-lasting head, clear (with some grain chunks). Looks the same as the non-Brett Saison. Flavor: Again phenolic and spicy notes dominate on the palate. No Brett funk detectable. Mouthfeel: Light body, average carbonation level, grassy finish with light funky tang (tart and astringent). Overall Impression: Flavor profile is close to no Brett Saison. The Brett only contributes to additional components in the smell and the tart, astringent finish. To be honest, I prefer the Brett infused Saison over the clean one. It kind of makes this beer a bit bolder and down-to-earth and reminds me of the original Saison setting (barnyard, refreshing beer). Really looking forward what will happen to this beer in the future. Overall Impression: Fresher examples had more raspberry on the palate. Nevertheless, this is a very nice beer. Really enjoying this. And not sweet like many other fruit beers. Really interesting! Really happy how all these beers turned out differently. I will do another batch of this recipe soon (without the raspberries) and play around with some different Brettanomyces strains. The raspberries were just a small experiment to see how much raspberries are necessary to get some of the fruit flavor into the beer. 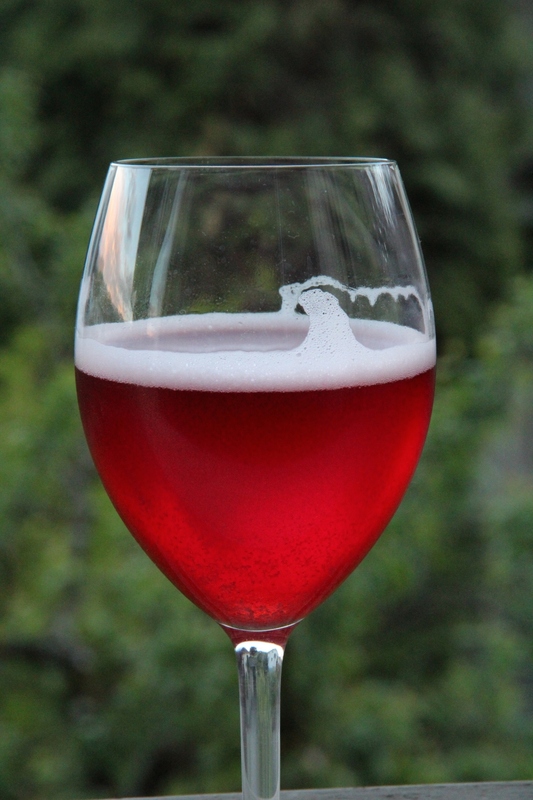 I will focus on some Berliner Weisse recipes soon and one share will be made with some raspberries. 200 g fruits per Liter of beer seem to work very well. Cheers!